Washington lies across the Columbia River just to our north. I’ve spent a lot of time at Ridgefield and I’ve written about my love for that little refuge but there are two more parks that are near and dear to my heart: Olympic National Park and Mount Rainier National Park. The Olympics literally go from the rugged coast (and tide pools) to rain forests to the snow-capped Olympic mountain range, along with plants and animals endemic to the Olympic peninsula. Rainier has its massive namesake where you can easily hike trails from the lodges and within minutes see pikas and marmots. There are many other trails too, such as the Summerland Trail in the Sunrise area where I met this hoary marmot sunning itself on the rocks. Sometimes I saw bears in both parks, sometimes quite close, sharing the trail with me. Deer and elk, birds, ground squirrels, so much wonderful wildlife living in such breathtaking scenery. Washington has many other wonders I never explored, I never even visited Seattle for that matter apart from one quick business trip. But I could have explored these parks alone for the rest of my life and never gotten bored. Goodbye, I love you. 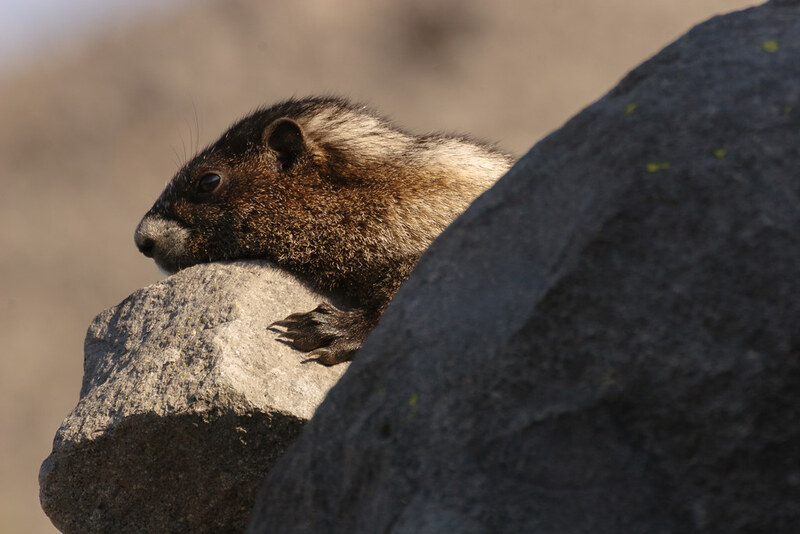 This entry was posted in Mammals and tagged hoary marmot, Mount Rainier National Park, resting, Summerland Trail, sunrise, Washington. Bookmark the permalink.